The Irish Free State offensive of July September 1922 was the decisive military stroke of the Irish Civil War. It was carried out by the National Army of the newly created Irish Free State against anti-treaty strongholds of in the south and west of Ireland. 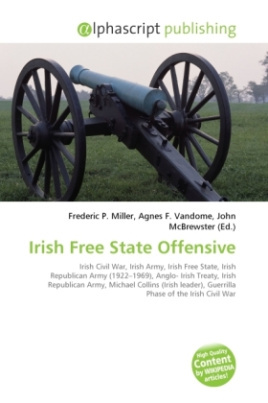 At the beginning of the Civil War in June 1922, the Irish Free State government, composed of the Irish republican leadership who had accepted the Anglo-Irish Treaty, held only the capital city of Dublin. The new National Army was composed of those units of the Irish Republican Army loyal to them, plus recent recruits. Much of the rest of the country was outside of its control, in the hands of the anti-Treaty elements of the Irish Republican Army, who did not accept the legitimacy of the new state and who asserted that the Irish Republic, created in 1919, was the continuing legitimate all-island state. This situation was rapidly brought to an end in July and August 1922, when the Commander in Chief of the Free State forces, Michael Collins, launched the offensive.